English is taught everywhere in Germany and is, by far, the most widely-spoken foreign language in the country. Students are taught British English everywhere in Germany. And not just Germany. In Europe, people tend to think of British English as ‘standard English.’ However, most German adults speak American English and use American definitions of words, like ‘quite’. For example, when a German tells a waitress in a restaurant that he wants “a sandwich with chips”, he expects to get a sandwich with potato chips (American English) rather than french fries (British English). Germans use American rather than British definitions of words. Germans don’t call flashlights ‘torches.’ They don’t call elevators ‘lifts.’ Why is that? Since Germans are taught British English in school, why do they speak American English? I don’t know the answer to that, but I suspect it is effect of American popular culture on German children while they are growing up. Germans see far more American movies and TV shows than British movies and TV shows. For example, ‘Die Simpsons’ is the most popular animated TV show in Germany and has been for 20 years. And Donald Duck is as familiar to German children as he is to American children. This is only a guess on my part. The next time you see an English-speaking German government official being interviewed on television, listen to the way he is pronouncing and defining words. It’s invariably American English. If anybody knows why this is, let me know. The Mystery of Donald Duck in Germany. Here is my second big mystery about Germany. Donald Duck is extremely popular in Germany. Over 250,000 Donald Duck comic books are sold in Germany every week; however, Donald Duck in Germany is very, very different from the Donald Duck we know in the United States. In the U.S., Donald Duck is foolish, hot-headed, and dim-witted; but in Germany, Donald Duck is just the opposite. 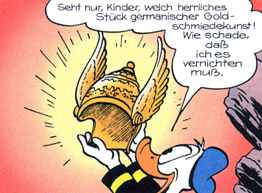 In Germany, Donald Duck is sophisticated, articulate, cultured, and well-read. Donald discusses philosophy, science, and literature with intelligence. He also frequently discusses politics and is sometimes quoted by German politicians. So – how did Donald Duck in Germany become so different from the American Donald Duck? Can you imagine our American Donald Duck discussing Viking mythology and Wagner’s operas with his nephews Huey, Dewey, and Louie? DONALD DUCK IN EAST GERMANY. Surprisingly, Donald Duck comics were both legal and widely-read in East Germany, but that was because the communist government in East Berlin saw Donald Duck as a critique of capitalism. Children in East German schools were told that Dagobert (Scrooge McDuck) was the ‘arch-prototype of capitalist greed and exploitation’. Well, that was true. Uncle Scrooge was both very rich and very greedy. Donald Duck symbolized the ‘downtrodden proletariat’ and his nephews Tick, Trick, and Tack (Huey, Dewey and Louie) were ‘socialist youth’ learning to become ‘good communists.’ I wonder what Walt Disney thought of this. He was notoriously and fiercely anti-communist. Ferrero, Europe’s biggest confectionery company, has been forced to pull its ads for their new line of white chocolate kisses. 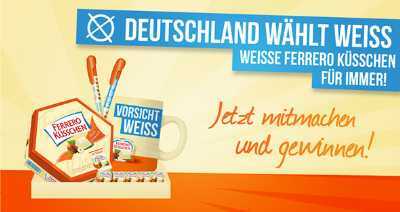 The product was designed for the German market, where white chocolate is more popular than it is in the US. Ferrero’s ads use the slogans ‘Germany chooses white’, ‘Germany votes white’, and ‘White kisses are best.’ Furious Germans demanded that Ferrero pull these ads because they mirror the position of Germany’s far-right anti-Semitic party, the NPD, which wants to restrict immigration to Germany to white Christians only. Obviously Ferrero wasn’t trying to develop a candy that would appeal to Nazis. They just hadn’t considered how these ads would sound in Germany, where neo-fascism is a very sensitive issue. Have you ever seen the movie ‘Titanic’? No, not the 1997 movie with Leonardo DiCaprio, but the 1943 version made in Nazi Germany. I collect movies made in Nazi Germany, and this is one of the best. No expense was spared in making this lavish movie. There are spectacular sets, beautiful costumes, and amazing special effects. The producers of this movie made a detailed 20 foot long model of the Titanic for the sinking scene, and they used a large luxury liner, a real one, to film the deck scenes. The special effects in the sinking scene are truly amazing considering the technology available in 1943. 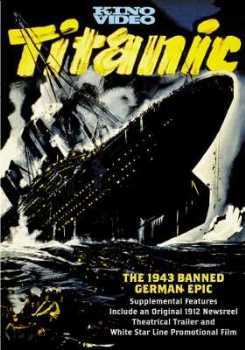 Despite the movie’s tremendous cost, ‘Titanic’ was never released in Nazi Germany. Dr. Goebbels, Hitler’s propaganda minister, did not like the movie’s message. In this version of the Titanic story, the hero is a German officer named Petersen. Petersen is convinced that the ship is traveling far too fast and is heading for disaster. He tells his superiors about his concerns, but he is repeatedly told to just obey orders and stop questioning the judgement of higher-ups. Petersen reluctantly does as he is told, and this leads to disaster. Goebbels did not like that message. He wanted the German people to just do as they were told, without asking questions. In this movie, the villain is a greedy, degenerate Englishmen named Ismay. In movies made in Nazi Germany, the villain was usually either an Englishmen or a Jew. Since there are no Jews in this movie, the villain is an Englishmen. If you would like to see this movie, give me a call. I have several copies with English subtitles.